These past two weeks have been a treasure when it comes to my bench. Bench, as of right now, is the only lift that I can actually push. So I am diving in head first. If you have read my past training logs, you’ll see that I have tried something very different. My bench program used to be set up with Tuesday being some sort of rep work or touching heavy weight and my Friday consisted of speed work. While this worked for a while, I have recently felt that I had become stagnant. It was time to mix things up and try something new. My bench program still has a rep work day on Tuesday but it consists of much more volume and my Fridays are specifically for my weak points. Having a day dedicated only to weak points has brought my bench up faster than I expected. When I last saw my physical therapist we discovered how weak my middle traps are. He recommended more rowing to help build this area. This area creates stabilization during the bench. This switch has produced two personal records for me. In the next month I will trying to hit some higher weights to really see what the switch has produced. I would recommend everyone add some sort of rowing every week. Most people need to develop their lower/mid traps. This being said, on your bench day or upper day try some barbell rowing, TRX rowing, cable rowing, or my personal favorite, inverted rows. I noticed Brian, one of our yoga instructors, was looking slim and trim this spring. So I pressed him- tell me about! 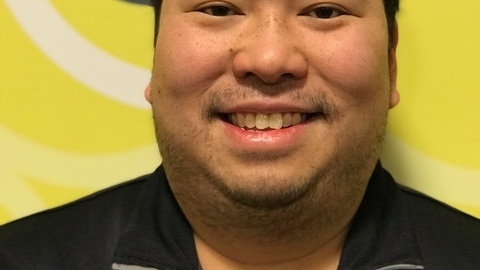 Brian lost 30lbs by getting to a doctor to deal with his sleep apnea, committing to one class at UF per week, and being consistent in showing up! It sounds easy, right? Watch the video or check out the highlights below to see Brian’s insight on how he was able to achieve this weight loss goal for himself. (0:47) My main motivation was to be healthier. I’m not getting any younger and I’m at a stage in my life where I needed to do more than I was doing in terms of physical activity and really needed to start to pay attention to my diet. My sleep apnea diagnosis was the big push for me to become more active. (3:00) I started with one class a week and just worked up from there. Cardio Lab was the first class I took. (4:30) Dating back to last year I’ve lost 30lbs. And there is no quick fix, it took small steps. (6:00) I’m trying to get into the mindset that this is a lifestyle- something that doesn’t end. And I want to remain active throughout. (7:30) Casey- In my first yoga class, I didn’t know where the ‘front’ of the room was. Brian- so don’t be afraid to ask questions! (8:30) (Hesitantly) Alison’s class is the one I have to get mentally prepared for. (9:40) Casey- To sum up how you did it (losing 30lbs), you got a CPAP, you took a small step and committed to one class a week, and you consistently showed up to do it. Turkey Chili…I know what you are thinking- I am a tad crazy because Chili is a warm, comforting, cold weather food. But, it’s one of my favorite meals, its full of nutrient dense ingredients, and it satisfies the heck out of me. My mom always says “it’s a hit” every time I make it for our family…Maybe she is just filling my heart up with confidence and joy, but I kind of believe her. Anyhow, here it is. Try it. It will last you for most of the week and you won’t have to put much thought into meal prepping. What a win! First: Pour olive oil in a large sauce pot. Throw in minced garlic, tomato paste and some black pepper. Stir to coat bottom and let garlic simmer for about 2 minutes. Second: Throw in turkey, cover with lid and let cook. 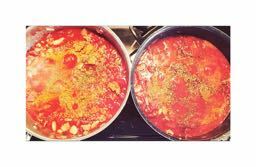 Third: Put all remaining ingredients in pot- diced tomatoes, tomato sauce, beans, spinach, and kale. The spinach and kale will cook down quickly, don’t hold back. Fourth: Spices- sea salt, chili powder, turmeric, pepper, oregano, and basil. Trust me. Let this all cook on low for about 45 minutes-1 hour. During our journey towards fitness goals, we will hit some walls along the way. Common plateaus could include struggling to shed those last couple of pounds or falling short on a strength goal. As natural as hitting a plateau can be, they are always frustrating. Now is the time to take a deep breath and a step back, then look at what factors may be limiting you to reach your goal. I have 4 main factors that I will look over when my progress has stalled. These factors are hydration, sleep, nutrition, and training. I’ll break each of these down to subgroups to further explain. Water is essential. As corny as that sounds it will always be true. With something so simple, it is often the first thing that is overlooked. Everyone (should) know that they must be well hydrated but most people usually fall short in drinking enough. Water is the ultimate detox drink and keeps your body from falling apart. With the lack of water being my number one concern there is another common mistake when it comes to drinking water. People tend not drink any water during the day and then having a drinking contest at night. 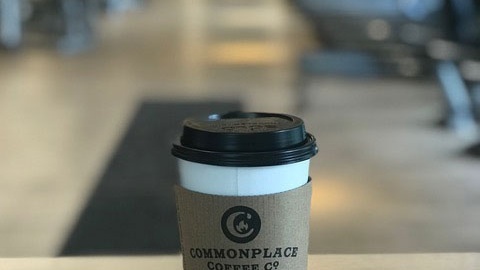 Maybe this sounds familiar- you woke up, had two or three cups of coffee, then maybe a glass of water with lunch (or worse, soda), then another couple of cups of coffee to make it through the afternoon, and before you know it it’s 5-6-7pm and you’re playing catch up with water. (And you wonder what keeps you up at night). At this point you decide that you are going to consume 8 glasses of water in the next 2-4 hours before bed. After about glass four you going to the bathroom every 20 minutes and the color of your urine matches the water you just drank. You are not a camel; you cannot store the water. So try to avoid the late night binging of water and keep a constant flow in your system throughout the day- like starting your day off with a big glass of water. If you have ever had me as a personal trainer, then I have asked you “how is your sleep?” an annoying amount of times. Sleep is ideal for brain function, building motor patterns, aerobic performance, and hormone balance. If you have any goal at all, even it is not fitness related, you must get optimal sleep. Now I am sure that you have heard that you must get 8 hours of sleep. As obnoxious as it is, 8 hours is a solid rule to go by for most people. Something that always gets overlooks is the quality of one’s sleep. The quality of sleep is by all measure more important than the amount of sleep. When I am referring to quality, things like tossing and turning, snoring, dogs, kids, bathroom breaks- all interrupting your REM sleep. There are different stages of sleep, in which all of them are very important. Each stage has an important function in regards to hormone production or neurological function. I am not a doctor but you if snore, I highly recommend getting a sleep study test. I have heard from countless people how their health improved. From waking up and feeling energized, to not needing to drink coffee anymore and one the greatest ones being blood pressure dropping to a healthy level. If you snore, call your local doctor to get a sleep study. If you toss and turn there are multiple factors that could contribute to this. The first thing I would look into would be what temperature your room is at night. I try to have mine around 65 degrees, if it’s too hot I am sweating and flipping my pillow constantly so I can get the cool side on my face. I would also look into your Vitamin D levels or consider vitamin D supplementation. When vitamin d levels are low, studies have shown a correlation between poor sleep or restless sleep. Dr. Stasha Gominak has done extensive work on sleep with some free videos online discussing vitamin D levels and sleep. Vitamin D supplements are very cheap but always consult your doctor before taking any supplement. I am not going to be discussing calories here. I want to discuss nutrients. Probably the most common goal we see are members wanting to lose “x” pounds, which is a great goal if this is something that will improve your health. Now with this goal in mind people immediately drop the calories and start running on the treadmill like they are training for marathon that’s happening next month. I get excited when people are motivated but drastic drops or extreme changes are not ideal, especially with food. Food should be considered fuel for your body while providing much needed nutrients at the cellular level. With that being said when you drop your calories so quickly, like someone jumping off a cliff, usually the first thing to suffer is your nutrient intake. Take a moment to think about what a caloric deficit is…now how do you expect your body to reach any sort of goal if it’s not getting the baseline ingredients it needs to be healthy. This is like asking a car to drive 100 mph with a flat and an empty tank. It just won’t happen. When performing any goal make sure you are getting enough fuel and nutrient dense foods to help you. Intensity is what some see as the most important factor in the fitness industry- maybe because it’s inspirational or it sells. Spend 2 minutes on Instagram or YouTube and you will see enough workout hype videos that involve people yelling and screaming at each other to get through their training sessions. Maybe this is fun to watch when you have a hard workout ahead of you but it’s not the most important factor. Consistency trumps all. Look at two types of people. “Richard” decides he’s going to commit to the gym after a whole year of putting it off. So he dives in day one and goes hard for two hours, posts a video to his Instagram with #savage underneath, goes home and forgets to eat dinner and stays up until 2am watching TV. Congrats Richard- you got ten likes and you’re headed down the road to Burnout Town. What’s the likelihood that Richard will be back in the gym the next day? Or what if he does and gets injured because he’s not taking any time to recover? His effort is great, but his lack of consistency will make his road tough and unpredictable, likely leading to a plateau or worse, injury. “Stan” takes a different approach. Stan is in the gym 4-5 times a week, always makes sure that he is getting eight hours of sleep, eating nutritious food, and drinking enough water to be fully recovered. Which is great because Stan can come to my classes more, hang out with me, and chip away at his fitness goals everyday. Here’s an example of the overall accumulation of work for Stan vs Richard. Because of Stan’s sustainable, consistent approach, he’s able to get to the gym 16-20 times per month. While Richard, if he’s lucky, will feel “good enough” to get to the gym 8-12 times per month. Moral of the story- don’t bite off more than you can chew. If you stay consistent, the amount of work will build up and show results. Being attentive to these four basic factors can help with any goal that you have in mind. When I feel stuck, I write these pieces down and look back to the past few weeks to honestly assess if and where I’m falling short. Once I’m able to pinpoint the issue, I fix it. One last thing that you should always consider when hitting a training plateau- am I being realistic with my goal or my timeline for my goal? 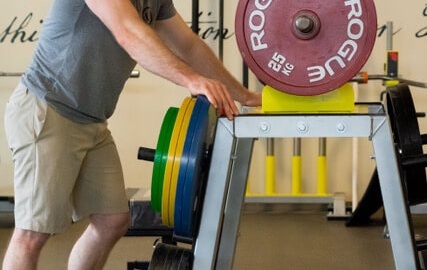 As powerful as this simple approach can be, getting to 10% body fat in six weeks or adding 50lbs to your bench press this month can be unfair to expect from yourself- and quite unrealistic, really. So when deciding your goal you need to be brutally honest with yourself. If you set an unrealistic goal and fall short you will get so discouraged that you may not reach any of your goals. Now set a realistic goal-aim at a target you can SEE and REACH, keep track of your four factors, and see what you can accomplish. So I actually trained this week, once. And that was all I could manage before I was whooped! It felt good to move. I’ll be sore from this one but that’s what happens when you start over. I’m just grateful I was able to train. Yes, this is a little untraditional for a “food log,” but I think it’s good to look at some of the stranger things we do in the name of health. I am a big proponent of intermittent fasting, though today’s sparse diet comes for a different reason. I’ve written about dealing with some health issues recently, and Tuesday morning I have another round of testing that requires 24+ hours of a clear liquid diet. So here I am, with my (fourth) coffee, typing away. Even when I’m not prepping for fun medical procedures, I do enjoy intermittent fasting (or IF for short). What that typically means is picking a cut off time for eating at night and then not taking in anything but the aforementioned water (often with salt) and black coffee until my fasting time is up. That can be anywhere from 12 hours (an easy place to start!) to 20 hours for me. So basically, I try to stop eating at 9pm, then don’t start eating again until 9am on a normal day, or all the way up to 5pm every once in awhile (but know that I eat some epic meals on those 20 hour days). Why practice fasting? I’m not doing this for weight loss reasons, though many people do! It’s also a useful reminder: sometimes we feel hungry, but skipping a meal every once in awhile (barring special cases like diabetes and hypoglycemia) isn’t going to kill us. It’s okay to be hungry sometimes! But primarily, fasting is a way to give my digestive system a bit of a break from having to process food – something that I have come to relish while I deal with these medical issues. There are of course tons of other benefits (there is a lot of interesting research showing that fasting beyond the 16 hour mark can increase autophagy, your body’s process of recycling old, damaged cell components), but this has been my focus. So that means most mornings look like this: I start out with about 32oz of water with some himalayan sea salt (full of minerals) and lemon juice, then just black coffee and more water until that fasting period is over. Since I’m trying to maintain or even regain some weight, I generally manage to squeeze 4-6 meals into my eating window. More about that in a future post! 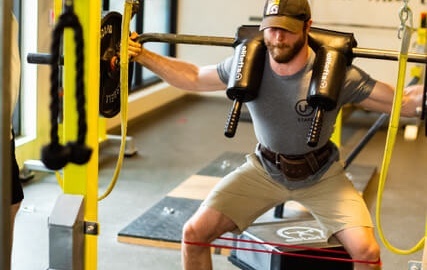 Earlier this year (side note: 2019 is really flying by), 33 of our members embarked on a challenge – the 2019 Strength Project. They were tasked with attending 28 classes over the course of 8 weeks (mid January to mid March) – split between our #powerful classes, Cardio Lab classes, and yoga classes. If they completed the challenge, they earned either a massage or some personal training sessions with one of us. 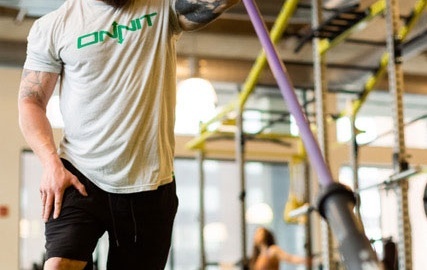 To help along the way, we provided some extra assistance in the way of private goal coaching sessions, personalized lifestyle change suggestions, a private Facebook group to vent (a popular add-on), and even some free prepped healthy meals. We’re finally finished tallying everything up and doing our final check-ins, and it looks like almost every participant completed the challenge! We have a lot of personal training sessions in our future! The “challenge” really looked different for each participant. Some of our members have no problem attending 3+ barbell classes per week, but yoga was foreign territory. We had quite a few people who took this opportunity to upgrade from Cardio Lab only memberships to having access to our full range of classes, so getting comfortable with the barbell was something new. They each took it in stride (and had the rest of the group to confide in when things got tough). What was the BEST part of the Strength Project? What was the WORST part of the Strength Project? Would you do a challenge like this again? What as your personal proudest moment during the challenge? We are so proud of each and every one of you, whether you made it through or not. Everyone made strides toward becoming a better version of themselves, no matter what. Keep an eye out for our next challenge, coming summer 2019! My April Training log is a little different from my previous 3 months of training logs. Reason being, there is a new goal in mind for June. I am training for a full power meet. This is new to me. The goal, that is. I’ve had a small seed in my brain that wanted to do a meet, so now I am letting that come to life and blossom. Honestly, this is fun for me. A new experience. A new zone of comfort to hop out of. I’ve mostly trained in a very bodybuilding manner. I am not going to use absolute terms and say that bodybuilding is the end all be all for me however, it lights me up…(in the least meathead-y way possible or not). So, maybe I can inspirit a flame in one person, and that is to add some productive discomfort to their life and see what is possible. As far as training goes, in the past I would have cycles of heavier compound lifts and I would have cycles of pure volume (very barfy) compound lifts. Both bring me happiness…well depending on my mood. My training for this meet is not too far off from a normal bodybuilding split for me. I have all my assistance work at 6-12 rep ranges, great. As for my main lifts, I am doing heavy work with speed work sprinkled in. Goal is to get faster. I am currently training 5 days per week. 4 days is my usual amount, but with this program there is a short day of some simple barbell movements and I am out. I have been reluctant to train more than 4 days per week for the past year due to hormonal imbalances from excessive training. My body is extremely sensitive to training and life stressors. Sometimes the life stressors I can’t control, but training I can, so let’s see how my body responds! Last blog I talked about how dependent I am upon my crockpot ever since having the baby. There’s only so much you can do with a crockpot though and I was bored. Needing constant variety in my life is both a blessing and a curse. And to be honest, I was a little embarrassed after my blog came out that I’ve been so lackadaisical in the kitchen. So I decided to stop making excuses and break out the ole culinary skills. Making healthy dinners for my family makes me feel goooood and despite what I was telling myself in my head, it really doesn’t take that long to whip up something healthy and tasty. I’ve waited longer for Grubhub delivery than it took me to make this meal. 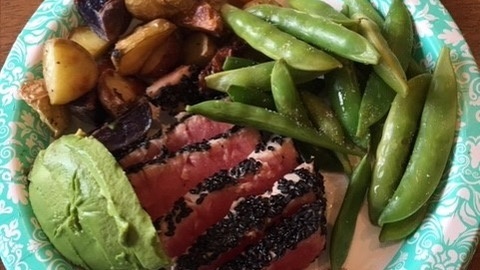 Sesame seared ahi tuna served with tri-colored roasted potatoes, sugar snap peas and topped with avocado slices. Asha: Mom, is this sushi? No is this steak?! It’s my favorite. Me: Kinda. It’s chicken of the sea. Asha: Ok so it’s chicken. Me: No, it’s a fish. It’s ahi tuna. It took about twenty minutes of explaining to them that Ashi (a nickname we have for Asha) Tuna is not a real thing. 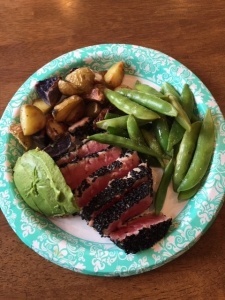 But considering that they still ask for “Ashi Tuna” every night for dinner, I don’t think it stuck. The lesson learned here for me is that memories are made over food and family dinners together. My kids will have no fond recollections of the takeout meal we had delivered but will surely remember the time they thought they ate Asha for dinner. Cooking a meal is more than just the pieces of food thrown together. Food can be a lot more than just nutritional subsistence and I think I forget that from time to time. 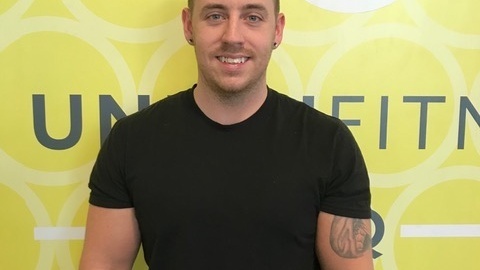 Michael Hutchins, LMT, graduated from Pittsburgh Technical College in October 2018. He is certified in cupping and IASTM and has plans to become certified in body tempering – something we’ve been looking for here at UF! Some of his favorite modalities of massage are deep tissue and vibration therapy with the Hypervolt. In his spare time, he is also pursuing a Personal Training and Corrective Exercise Specialist Certification through NASM.